The UFHCC has a pre-review process for all cancer-relevant IITs categorized as “interventional treatment” or otherwise involving investigational drugs, devices or medical procedures. 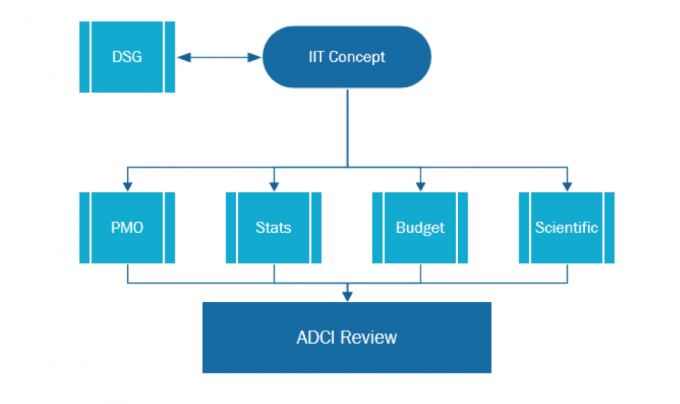 This review, performed through the CDG, is mandatory for any IITs planning to utilize UFHCC CRO resources including Project Management Office (PMO) services, research coordinator or data entry support, regulatory management, financial or other in-kind support. Concepts not meeting these specifications are exempt from this mandatory pre-review, but may request this service. The aims of this comprehensive review are to 1) improve the feasibility, scientific merit and ultimate success in completing cancer-relevant IITs, 2) shorten the timeframe from concept approval to protocol activation and 3) maximize staff and investigator effort in protocol development. To submit for pre-review, a concept must first be endorsed by the respective DSG research leader. The endorsed pre-review form should then be submitted to PMO@cancer.ufl.edu for Project Management, Statistical, Budget and Scientific review to commence. Reviewer comments will be provided to investigators along with scientific quality and feasibility assessments as endorsed by the associate director of clinical investigation (ADCI).